While the bride and groom were born in London, their parents were born in Cyprus, so it was not surprising to see many traditional included in the occasion. Our day started at Georgina’s home, as her seven bridesmaids helped her get ready for her big day, with the preparation of the bride and groom being almost as important as the wedding ceremony itself. 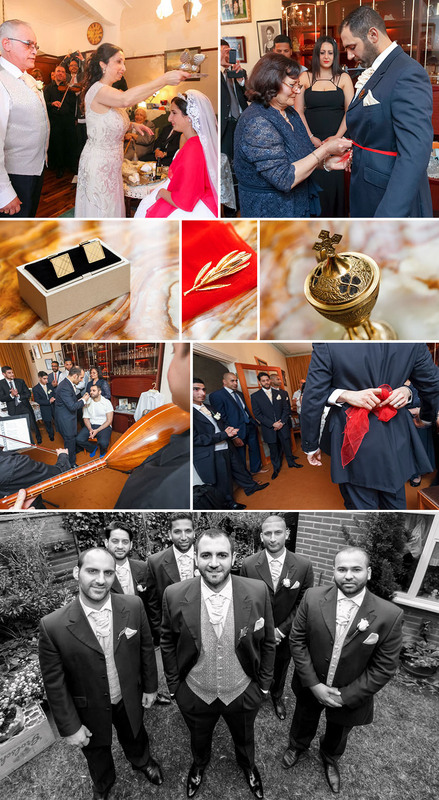 Georgina incorporated the Stolisma into her pre-wedding rituals, complete with the traditional lute and violin. After leaving Georgina to finish getting ready and get herself to the church, I joined the festivities at Evros’ house where his groomsmen were helping him get dressed, and where he was also symbolically tied with a red scarf. The setting of the ceremony was the Greek Orthodox Church of St John the Baptist in North London. I have been lucky to be the wedding Photographer for several happy ceremonies here, and it is always a pleasure to be within its very decorative walls. With a stunning gold chandelier as a centrepiece, and brightly painted iconography by artist Eleftherios Foulidis, there is always something beautiful to look at, though none as captivating as the bride and groom. All weddings are beautiful but there is something about a Greek Orthodox wedding that really stands out. The couple wore crowns, called stefana, tied together with ribbon to symbolise their unbreakable union, and exchanged rings which were engraved with their wedding date and a significant message. 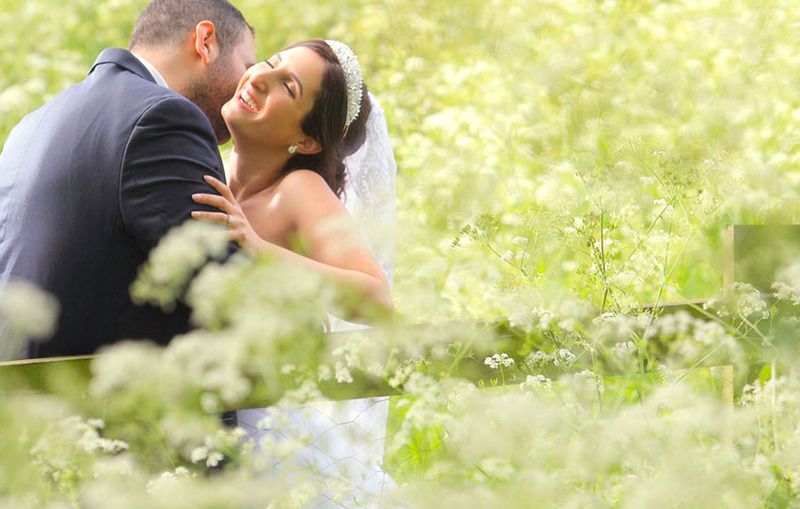 Evros and Georgina met when the bride’s God-sister and the groom’s best friend decided to play Cupid. As they say: the rest is history! After the ceremony we moved outside for photos in the park. 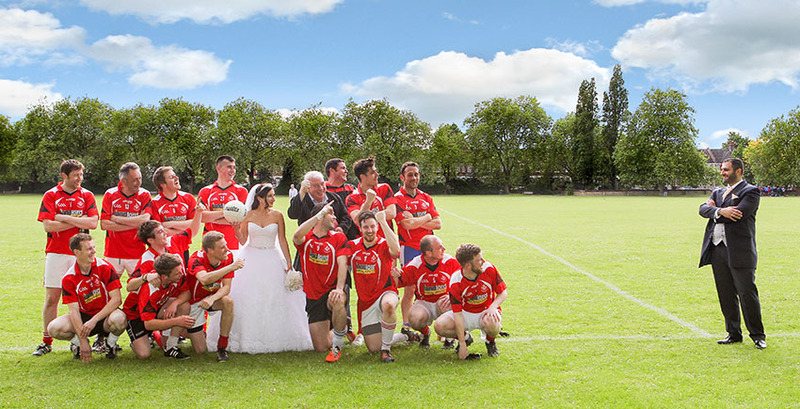 Despite being surrounded by seven stunning bridesmaids, Evros only had eyes for his wonderful new wife, and the early summer meadow was the perfect backdrop for some romantic photographs of the newlyweds. The wedding reception, which took place at the Regency Banqueting Suite in North London, was as lively an affair as you could hope for from a Greek Cypriot wedding, with lots of food, music and laughter. The happy couple were pinned with money as they took to the dancefloor, where they stayed for the rest of the night, while the band made sure that everyone capable of dancing was up and having a good time. Congratulations to the new Mr and Mrs Agamemnonos! If all your married life is even half as full of colour, love, and joy as your wedding day you will be lucky. Thank you for allowing me to be your wedding Photographer.